Ripe, juicy cherries hangout inside of sweet, buttery cupcakes studded with mini chocolate chips and topped with fluffy vanilla bean buttercream. Cherry chocolate chip cupcakes are about to be your favorite summer treat. Cherries have been my summer love this year. I’ve been keeping a bowl of freshly-washed cherries stocked in the fruit drawer at all times. Every time I open the fridge, I pluck a few of the sweet, red orbs from the bowl. By the time I’m finished munching, the pads of my fingers are a deep shade of red. The cherries have been extra sweet this year. So sweet, in fact, that I’ve traded my usual dark chocolate covered almonds for the candy-like fruit. Cherries are also the perfect fruit for playing fun picnic games. I like to play a little game called “Spit the Pit.” Here’s how it’s played: You’ll need at least two people to play the game, so grab yourself a pit-spitting partner. Pop a cherry in your mouth and dig out the pit. Then, proceed to launch the pit from your mouth with every ounce of jaw power. The person who launches the pit the farthest wins. Yes, you’ll find me on the lawn spitting cherry pits with the rest of my weird siblings. It’s summer fun for all ages. I was able to spare a few cherries for these cherry chocolate chip cupcakes for the celebration of Sally’s upcoming marriage to her number one taste tester, Kevin. 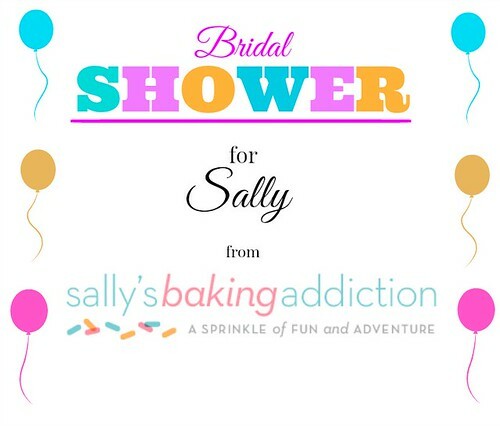 The theme for Sally’s shower is, of course, sprinkles–her favorite! I couldn’t help but notice that cherries are bright red and heart-shaped–completely appropriate for the occasion. To match the red cherries, I added a healthy sprinkle of red and white jimmies. You guys are going to love this recipe. Why? For starters, these cupcakes are going to rock your world. Second, the batter comes together in one bowl with one whisk. No mixer needed! Excuse me while I interrupt this post to day dream about these cupcakes. I used melted butter instead of softened butter for this recipe. The result is a super moist, tender cupcake. It’s the kind of cupcake that melts in your mouth as you chew. The use of melted butter makes for an easier batter. One bowl. Less dishes. You know you like the sound of that. I also added sour cream to the batter. Not only does the sour cream add moisture, it adds a slight tang to the batter. Since these are cherry chocolate chip cupcakes, they wouldn’t be complete without loads of pitted cherries and mini chocolate chips. Yes, you have to pit cherries, but you only have to pit enough for half a cup. May I suggest a cherry pitter? My life changed when I received my oxo cherry pitter. Life before my pitter was messy–well, messier than usual. I’m talking cherry-splattered walls and clothes, red stains on my cutting board, and cherry juice on the dog. It pains me just thinking about it. Wait…it gets better. I added a swirl of fluffy vanilla bean buttercream to each and every cupcake. Let that sink in. Moist, tender cupcakes loaded with pitted cherries and mini chocolate chips with a swirl of fluffy vanilla bean buttercream. Preheat oven to 350 degrees F. Line a 12-cup muffin tin with cupcake liners. In a large bowl, whisk together melted butter and sugar until combined. Whisk in the eggs one at a time until just incorporated. Whisk in sour cream, vanilla extract, and almond extract. Add the dry ingredients right on top of the wet ingredients. Using a wooden spoon or rubber spatula, mix until thoroughly combined. Fold in the chopped cherries and mini chocolate chips. Fill each tin 2/3 full with batter. I find it easiest to use a 1/4-cup cookie scoop. Bake for 20-22 minutes, or until a toothpick inserted into the center comes out mostly clean (a few crumbs are okay). Allow the cupcakes to cool in the tin for 5 minutes before transferring to a wire rack to cool completely. In the bowl of a stand mixer fitted with the paddle attachment, cream butter until light and fluffy (about 2 minutes). Turn the mixer down to low and gradually add the powdered sugar to the bowl, stopping the mixer to scrape down the sides of the bowl every few minutes. Once all the sugar has been added, turn the speed up to medium and beat for 2 minutes. Scrape down the sides of the bowl and add in the vanilla bean paste. Give the mixture a few good turns. Turn the speed down to low and slowly drizzle in the heavy cream. Once all of the heavy cream has been added, turn the speed up to medium and whip for 1 minute. Scrape down the sides of the bowl and give it one more good whip. Transfer the buttercream to a piping bag attached with a round #14 tip. Or, you can skip the piping bag and add your buttercream to the cupcakes with a cake spatula or butter knife. If you’re using a piping bag, pipe a swirl of frosting on top of each cupcake. Top with colorful sprinkles. Well, these sound deeeeelightful! Also delightful? Power-spitting pits across the lawn. Or at someone you love. You are so very welcome, Sally. I’m so happy you enjoyed your foodie shower. I wish you a long and happy marriage. You’re going to make one gorgeous bride. I can’t wait to see pictures. I thought it was just me, but the cherries do seem sweeter and altogether awesome this season! I love these cupcakes – you’re never too old for sprinkles and a delicious dessert that just makes you feel all yum about life. NEED cherries in my cupcake like yesterday! They really are sweeter this year. I can’t get enough. Love these cute cupcakes! Chocolate and cherry is one of my favorite combos! These cupcakes look amazing, Jennie! I love cherries and will miss them when the season is over. I wish we could have the real shower so I can have one of these beauties! You just reminded me that I need to start pitting and freezing my cherries. Thanks, Anna! These are SO beautiful!! What a great treat for summer AND for Sally!!! I love reading all the recipes for Sally’s bridal shower! She’s one of my favorite bloggers, and all of these sound perfect. I found a lot of amazing blogs through her (like this one!!). Thank you so much, Alexis. Sally is a great gal and talented baker. I’m glad we were able to make her day special. These cupcakes look awesome – cherries and chocolate chips are such an awesome combo! Cherries create the worst stains. So worth it, though. Thanks, Ashley! Thanks so much, Del! It’s so very nice to meet you as well. Thanks for stopping by. These cupcakes look amazing. Cherries, chocolate and almond?! That may be one of the best combinations. Now to get a cherry pitter that actually works, the one I have just smushes the cherries, not too useful! I love my oxo cherry pitter. It’s a beast. Thanks so much Stacey. These cupcakes look perfect for the few cherries that escape my straight from the bag binges! It’s hard to resist the cherry. It’s such a sweet fruit. Thanks so much! I haven’t made ANYTHING with cherries yet this summer. Can you believe that?! I think I’ve only eaten them once or twice as well. What’s wrong with me? That sounds like a fun picnic game! I’ve been loving fresh cherries this summer, too! I just can’t get enough of them! They have been so good this year. How adorable are these?!! So perfect for Sally! Gorgeous, gorgeous, gorgeous! That’s the only word that comes to mind, Jennie, because these photos and your cupcakes are too beautiful for words. What a lovely party to throw for Sally. And I agree with Movita – nothing ramps up the class factor than spitting cherry seeds long distance. Bonus points for hitting things like other people. We used to have water mellon seed spitting contests. I need to find a spitting partner for cherry pits. I bet they go even farther :) Love the balance of flavors in these cupcakes. We just got cherries here so I’ll have to give them a try!